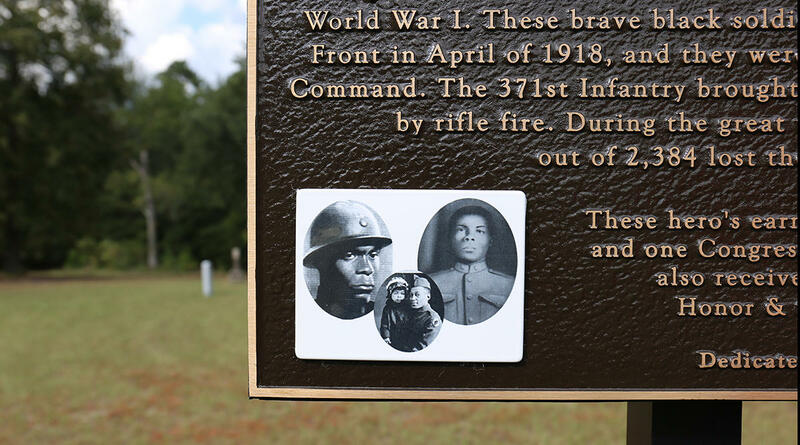 An historic marker honoring the 371st Infantry now stands at Childs Cemetery in Columbia. For those who love military history, the date September 28, now carries an additional significance. It’s the date Cpl. Freddie Stowers was killed in battle. Stowers was an Anderson County native and a member of the 371st Infantry Regiment, the first African-American unit to train at then Camp Jackson. The date now also represents the placing of the first historic marker in the country to honor and recognize this unit. South Carolina Public Radio talks with a Midlands woman working to help preserve the history of the 371st Infantry Regiment. Grantham says 500 or more graves could be buried at the cemetery; not all of them have markers. For several years, Grantham has worked to make the history of those buried at Childs cemetery known. She says, here work was not hindered by the 2015 historic rain event and flood. "Even though it is in a flood zone site, remember when we drove up, the cemetery is up on a hill. The cemetery did not flood," Grantham said. Instead, Grantham says it is time that’s doing the most harm to the history buried there; she said people have just forgotten about it. "The legacy of the 371st is forgotten or unheard of [and] I'm going to work to preserve that legacy." "This unit was organized in the Fall of 1917 and made up of almost exclusively of South Carolinians," said Dr. Fritz Hamer, curator and archivist at the South Carolina Confederate Relic Room and Museum. 'They came from all walks of life and all parts of the state," he added. The unit was made up of roughly 3,000 men, when they got the France. An excerpt from a Relic Room handout details how the troop served during this time. The 371st was given French equipment and had to turn in their prized Springfield rifles for French rifles. The unit was reorganized to fit the French army structure and spent the spring of 1918 training in French tactics and communicating via interpreters. That summer, the regiment was put into the line to relieve exhausted French and allied Italian units. Having experienced battle, the [unit] was then thrown into the climatic “Final Offensive” of the Great Wat in September and fought well, suffering heavy casualties: over 1,000 men out of 2,384 were lost in eight days. They won battles, capturing prisoners and great quantities of German munitions. Even more startling was the feat of shooting down three German airplanes with rifle and machine gun fire. The unit returned home to Columbia from Europe in 1919. Dr. Fritz Hamer talks about how the 371st was received when returning to Columbia from Europe.